Nikken's Major Dream holder provides the optimum tool holder solution. The system is available to suit numerous tool shanks but when combined with Nikken's 2-lock (BT Double face contact) design the internal dampening mechanism comes into it's own and delivers excellent cutting performance (heavy-duty roughing through to super-fine finishing) and reduced tool wear. Major Dream Holders deliver this optimum solution on any machine tool be it linear guideway or box guideway machining centres. TiN Bearing Nut (HV2, 200). Through coolant option using J Nut. Optimum machining on linear and box guideway machining centres. 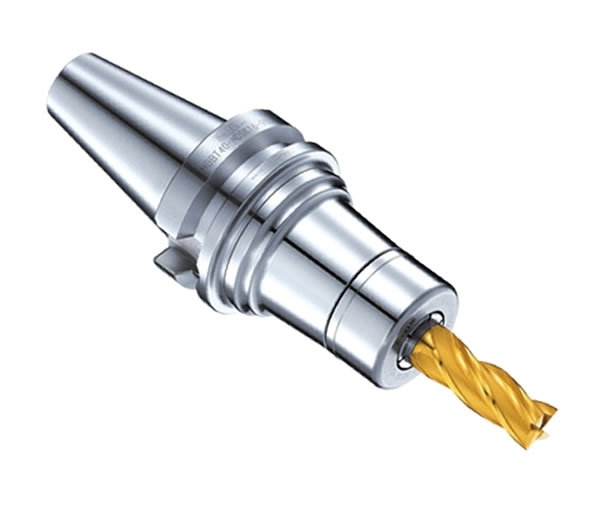 Suitable for high-speed machining applications. Reduced micro-chipping of cutting tool edge. Considerably increased tool life and surface finish. Available as standard on Nikken 2-Lock for both BT and DIN tapers, Major Dream also offers the benefits of dual contact for both flange and taper on suitable machine tools (2-Lock is also fully compatible with standard BT/DIN type spindles). 2-Lock increases the contact area considerably from around 44.4mm to 63mm (BT40) and also, as with all our NC tooling products, provides users with over 80% taper contact as standard. Additional standard options of course also include HSK and Nikken Polygon tapers.